Detectives investigating two targeted shootings which are believed to be linked have spoken to more than 100 people as they revisited the scenes. In the first incident, shots was fired at a Kia Picanto in Lenzie, East Dunbartonshire, at about 20:45 on 23 November. 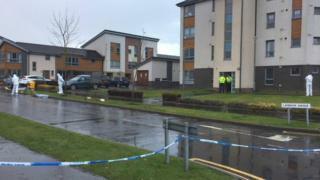 Just over three hours later, at about 23:50, shots were fired at the window of a flat in Kenley Road, Renfrew. Police said they were following up potentially positive lines of inquiry. They have also said they were keen to speak to anyone who remembers seeing a silver/grey Mazda 2 car on Lumloch Road on Thursday 23 November, which they believe may have been involved in the first shooting. No-one was injured in either incident. One week on, officers spoke to about 40 drivers and pedestrians at the roundabout at Lumloch Road, at its junction with Auchinloch Road, Lenzie. They said several positive questionnaires were completed for follow-up statements to be obtained. At the roundabout at Laymoor Avenue, and Kings Inch Road, Renfrew - near where the second shooting happened - 61 people were spoken to by officers. Det Ch Insp Martin Fergus from Police Scotland's major investigation team said: "The aim of this operation was to speak to members of the public who perhaps use these routes on a regular basis, around the times that the incidents took place, in the hope that they remember something which could assist our inquiries. "We have spoken to more than 100 people and received positive feedback. This information is now being assessed by officers in the inquiry team, with any relevant lines of inquiry being followed up."